Battery Asking » Cleaning » Best Pressure Washer Under $100 (Reviews 2019) – Why is my pressure washer losing pressure? Do you ever wonder how the world would have been without pressure washers? You wouldn’t want to imagine! In the current world where every hour counts, pressure washers are highly treasured for the way they simplify the extensive washing to appear as a small task. Again, hygiene is one thing pressure washers have helped to uplift. In the olden days, hand and bucket mopping while bending, squatting, and squeezing water with bare hands was the only way to wash floors. Civilization and modernization have changed all these and innovated pressure washers to better all heavy washings and also the cumbersome ones such as cleaning the underside of your car. Many of the units are exorbitantly priced, and that is why you might not have had a chance to own one. Probably you didn’t know that you could find a cheaper pressure washer. Yes, there are some which are under $100 that are equally effective and efficient in multiple cleanings. In this review, we have picked the ‘best pressure washers under $100’ to make your search easy and quick. Join the conversation to learn more on each pressure washer in this review which may lead you in making your best choice. Q: Can a pressure washer with less than 2000 PSI be efficient and effective for cleaning services? Q: Why is my pressure washer losing pressure? What is your best choice you found most suitable for your use? Greenworks GPW1500 is a 13 Amp 1500 PSI with a water flow rate of 1.2 GPM. It has quick-to-connect nozzles which you can easily switch according to the task at hand. Such is the power to clean any dirt or grime and leave your surface spotlessly clean. It comes with a 35-ft power cable that allows you to clean a large area without switching outlets. The power cable has inline GFCI which will cover you even if your outlet does not have it. If you require including detergent in your washing, you need to fill the soap holder with detergent and fix it on the wand attached to the 20ft high-pressure hose. Using soap for your pressure washing prevents wear and tear and especially when cleaning your vehicle. Greenworks GPW1501 features a hose reel that neatly holds any unwanted length of your hose to unwind as you move further and further. Among its accessories, it has a surface cleaner which many pressure washers don’t have. Always check on the hose connector to make sure you connect it tightly as it leaks if not well connected. Apart from that, Greenworks GPW1501 is a compact yet powerful pressure washer that competes with other bigger and higher PSI pressure washers but at under $100. It has a size of 11.4” x 17.1” x 9.4” and weighs 16.45 lbs. We present to you Sun Joe SPX201E which is a mini dynamo in breaking dirt and grime from any of your dirty surfaces. It is a powerful 10 amp motor with water pressure of 1350 PSI and water flow rate of 1.45 GPM for quick and effective cleaning. You can adjust nozzles to wash various surfaces and have fun watching the effect it has on dirt surfaces. Adjusting nozzles give you the option to spray wash gently or intensely spray washing, a choice you will make according to the job at hand. The TSS system is responsible for protecting your pump from overheating by automatically shutting off the motor from running when the trigger is not in use. Besides safeguarding your pressure washer pump from a breakdown, it becomes economical to switch off power when not required. There is no hidden corner or ceiling height you wouldn’t reach to clean with the help of aluminum extension wand and its 20 ft high-pressure hose. It also uses 35-ft power cable to move freely and confidently in knowing you cannot trip the pressure washer because of a tight cord. The downside of this pressure washer is that it cannot handle tough cleaning since the pressure of 1350 PSI is quite low. Otherwise, you can use it to wash glass cabinets, your vehicle, glass windows, and other delicate surfaces. With 1600 PSI water pressure and a flow rate of 1.2 GPM and using both axial and the pump, Yard Force is powerful enough to handle various cleaning tasks. It’s a 13-amp electric motor that is super quiet which you can use in a quiet environment such as hospitals. Yard Force pressure washer is equipped with a built-in 32 oz soap tank to increase cleaning effect and especially when cleaning greasy surfaces or build up grime and dirt. With the combination of the soap and the pressure water, you are sure to experience excellent results. You can drain the detergent when you want to switch to use a different one by pouring it through a drain plug you will find at the underside of the tank. It is a quick-to-connect by either using 25 degrees or soap nozzle for your regular surface cleaning. The pressure washer includes a turbo nozzle for tougher stains and hard surfaces such as metal rails, concrete, brick walls, and any other hard surface cleaning. Yard Force 1600 PSI has a trigger handle with a wand that connects standard washer fittings and accessories you may require using a ¼“metal without the need of an adaptor. The 35-ft power cable is long enough to cover a long distance and backed by a 19-ft hose. The washer is portable by either lifting or rolling using its rear wheels. Its handle is collapsible, and it has built-in storage for all the accessories for well-organized storing. The only downside with this unit is the few nozzles it has that can limit you to various uses. Other than that, it has proven to be efficient in delivering profound services. POWER is a high tech pressure washer with modern technology, modern design, and the latest induction (brushless) motor of up to 1500 PSI with a water flow rate of 1.3 GPM. Even though it might be high priced compared to the universal motor of the same 1500 PSI, POWER pressure washer is priced the same without compromising anything. Being an induction motor means high power efficiency and no wonder it goes by the name POWER. An induction motor runs on a lower RPM (revolution per minute) and therefore has four times longer lifespan. POWER pressure washer has the latest and unique 2018 design that hasn’t been there before and not in any other washer in the market. Unlike other induction motor pressure washers, this one is a lightweight and a compact one perfect for portability weighing 24 lbs with size 18.8×11.3×14 inch. Despite the size and the weight, it can handle all your cleaning tasks efficiently without causing damage and especially the paint when cleaning your car. It comes with a 10-ft power cable and 20-ft hose. It features a micro-switch – TSS (Total Stop System) that is sensitive to water flow in the pump. It automatically switches off the motor when the water flow cuts either by the release of a trigger or other causes and thus preventing overheating the pump. Since POWER pressure washer is an induction motor that has a low RPM, it is quieter and fit to use in a quiet environment such as hospitals, schools, or even a close neighborhood. Once you buy POWER pressure washer you will be given a 100% money back guarantee if you don’t like it which is an assurance of a high-quality pressure washer. What you might find a flaw with POWER pressure washer is its 10-ft cable which is somewhat short of reaching far. Other than that one downside, it is a pressure washer you should plant to have. SereneLife is a pressure washer for those looking for an easy portable washer that takes a small storage area. The pressure washer has the capacity of 1160 PSI and water flow of 1.3 GPM with a power output of 1200 watts. It has a nozzle wand attached to a trigger-spray gun that you can adjust the nozzles depending on the task at hand. It operates with two nozzle tips, one for everyday use and the other one for stronger pressure (turbo) when dealing with those stubborn stains or caked mud on your driveway. SereneLife will bring back serenity to your life by leaving you with a clean environment and also quieter when operating it. It is ideal for all your household cleaning chores and especially the ‘most dreaded’ on which is car washing. The pressure washer housing is constructed from rugged and water resistant ABS material with marine grade rating IP-X5. It has a universal 3/4″ threaded adapter of USA standard. A reinforced PVC material for the 11.5-ft high-pressure water hose and a 10-ft power cable both long enough to cover your working area. If you need to move further, it features an easy to hold handle for portability and which you double it as your cable hook for tidy storage. It has a money-back guarantee within 30 days of return in case it is not functional or does not satisfy you. Being a high-pressure washer has one downside. Both the high-pressure water hose and the power cable are not long enough to move far when you have a large area to cover in your washing. Realm BY01-HBE is a powerful pressure washer for capable in undertaking various cleaning tasks with excellent results. It is a compact pressure washer if you are looking to own an efficient yet small in size pressure washer. The pressure washer is powered to generate up to 1500 PSI with a water flow of 1.5 GPM for complete excellent cleaning. It operates on a 120-v / 11 amp motor making it lightweight and yet reliable in performance. Realm BY01-HBE comes completely assembled but for a few attachments which are easy and quick to fix. It is versatile to clean both horizontally and vertically with much stability. It means then that you can use it to clean surfaces as well as walls, doors, and windows. 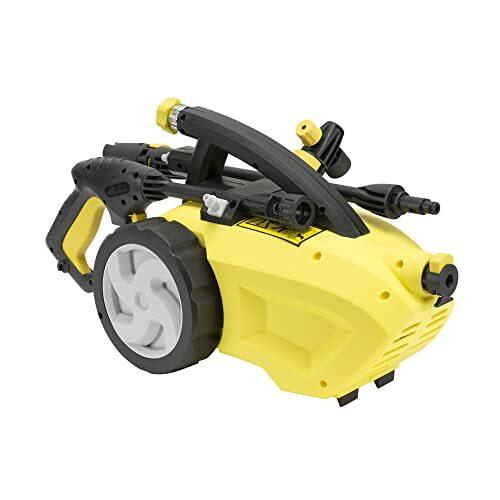 The pressure washer has a 19-foot high-pressure hose that quickly connects to the same pressure gun that has a nozzle tip you can adjust to your desire. A detergent bottle is one of the accessories that come with Realm BYO1 which can endure the high pressure from the hose. The other attachments and accessories also have quick and easy connectors including the different nozzles, patio cleaner, and the brush. It also comes with a 35-foot power cable that will allow you to move conveniently while cleaning. The pressure gun releases water only when the trigger is engaged. When it is not engaged, the machine automatically shuts down to prevent overworking the pump. It is also an advantage since it will conserve energy for you. However, Realm BY01-HBE is not a pressure washer you can use for heavy washing since its pressure which is only 1500 PSI might not handle such a task. TACKLIFE is a high efficient pressure washer that generates 1600 PSI pressure with a water flow of 1.72GPM and an electric power of 1400 watts. Such water pressure is ideal for various cleaning tasks such as driveway, patio, deck, vehicles, home, upholstery and many others. The CSA-approved pressure washer comes with a 35-ft GFCI plug power cord and 20-ft high-pressure hose. With both of these items, you can continue cleaning without care of running short of the cable or hose. For cleaning efficiency, the pressure washer comes with three wands with special spray effects. One is an adjustable spray wand to select whether light spray or turbo one for heavy cleaning. The other one is for a spiral spray that has a full rotation to cover a large area for effective cleaning. The third one is a detergent tank spray wand which sprays soap automatically after connecting it to the spray gun. The soap spray is ideal for cleaning vehicles and other greasy surfaces. The pressure washer has a micro-switch also known as Total Stop System that protects the pump from overheating. TSS enables the motor to switch off when the trigger is not on operation. The pressure washer is portable since it weighs 16.15 lbs. 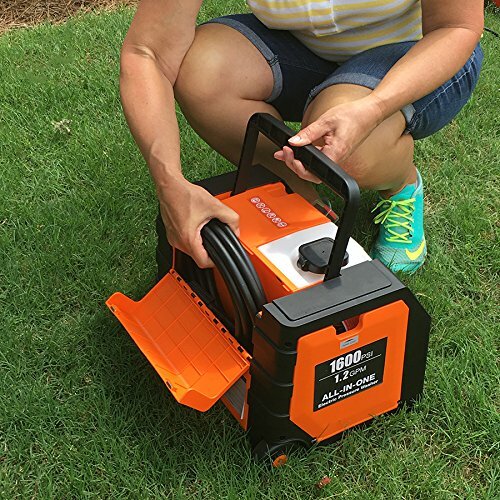 You can lift it by using its big handle which doubles as a place when you can roll the hose and the electric cord when in storage. One downside with this pressure washer is that the manufacturer either forgets to pack the manual or it does not have one. If you can fix the fittings without directions, then it will be a great pump to have around. You may need to know that a pressure washer with as little as 1300 PSI with 1.5 GPM water flow can wash your concrete floor as well as wash your car. What you need to check carefully are the nozzles it has for its use and the rate of water flow it also has. Some of these small PSI pressure washers have two adjustable nozzles and a turbo nozzle which complete the cleaning tasks effectively. Some of the main reasons for a pressure washer to lose pressure are leakage either at the end of the gun or the hose. While most pressure washers from the best brands have been constructed with much care, one can escape the ‘hawk-eye’ of the manufacturer and end up with a slight fault of leakage. Some of the pressure washers have a warranty or money-back guarantee for such cases. Be keen to check either of these two clauses before making your purchase. After going through this review, we believe you have made up your mind on what pressure washer you need. Do not stop there. Click on the unit you have selected to place your order immediately. That way, you will get to use your pressure washer as soon as you need it. Please take your time to leave your comments here below.